I am going to have to check if they sell it over here. 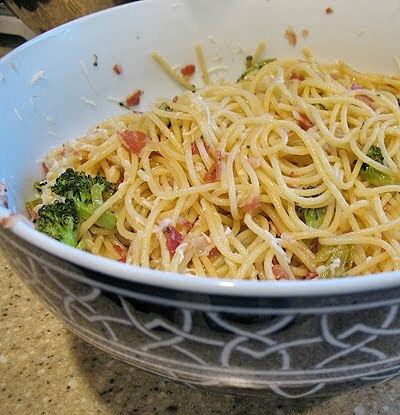 My kids love pasta and sometimes it's hard to come up with new & exciting ideas. This one looks really good. This sounds delicious! Another book to add to my library list – thanks for the recommendation and the additional links! Nice, Amanda! My garden broccoli has given up the ghost after 6 months of production, but the ichiban eggplant, which I think would also work well here, is still going strong. This type of simple, not very saucy pasta is just so satisfying. Thanks for sharing. Anything with pancetta works for me. I love the big chunks in your pasta as it adds so much flavor. I will have to check out this book, thanks for the suggestion. Looks delicious Amanda. I could eat pasta every night! Yummy spaghetti! 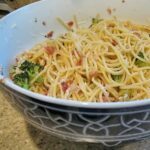 I like the addition of pancetta here! 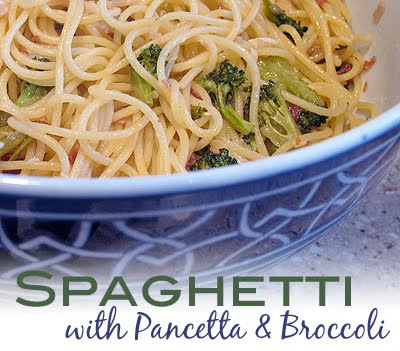 This sounds like the perfect weeknight dinner! I have a bunch of pancetta in the freezer. Definitely need to whip up a version of this. I love recipes like this, where simple pantry ingredients come together into something wonderful! 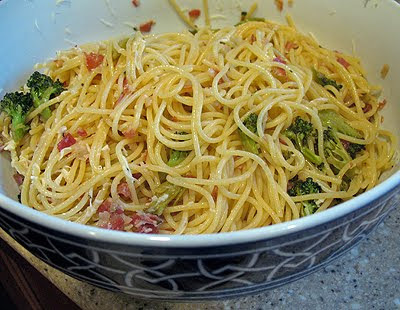 (I just bookmarked your pasta with chicken thighs and green beans, too!) Also, I just borrowed Guiliano Hazan's Thirty Minute Pasta from the library – haven't tried anything yet, but it might give you more of the same! 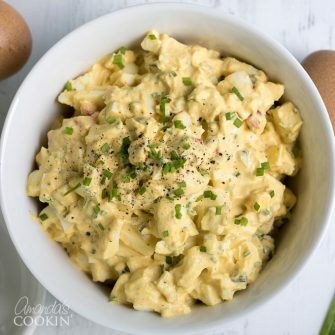 Amanda I always enjoy your recipes and this one is perfect for the summer. Light and healthy! All my favorites in one dish. Yum!